The full 2014 Melbourne Cup field has been announced including the drawing of the all-important barriers, with the full field of 24 runners is set to go on Tuesday, November 4th. The full field, odds for each runner and the favourite are now all decided. Saturday’s racing saw Signoff win the Group 3 Lexus Stakes, with the Darren Weir-trained gelding making his way into the starting line-up after a tough victory at Flemington. He subsequently rocketed to rank second favourite to 2014 Caulfield Cup winner and Japanese raider, Admire Ratki. Racing Victoria handicapper Greg Carpenter elected to issue a 1kg Melbourne Cup penalty for Signoff, and he will carry 51kg into the race – the smallest impost for any horse. Admire Rakti carries 58.5kg, the highest handicap, after he was penalised for his Caulfield Cup win. Most of the horses given the best chance to win the $6 million cup drew favourable barriers. The favourite, Admire Rakti, drew barrier 8, which also drew smiles from the Japanese connections. Lucia Valentia drew barrier 2, while Fawkner drew barrier 9, next to Admire Rakti. Signoff drew barrier 16 in the worst draw for a top favourite, but it’s a barrier that gives him options. The unluckiest horse was German horse Araldo, drawing 24, also known as the ‘carpark’. He’ll need a lot of luck from there. 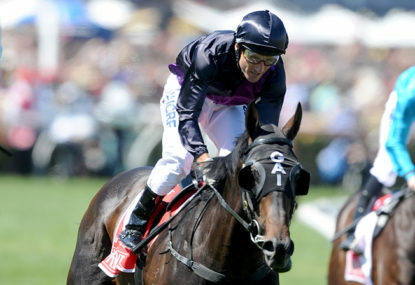 Barrier 11 is the most successful barrier in Melbourne Cup history, with seven wins, the last in 2001. The 2013 Melbourne Cup was won by Fiorente, from barrier 5.